Studio Line: MGM - All hell is about to break loose. Supernova starring James Spader and Angela Bassett, is a compelling science fiction thriller that chronicles the high-stakes adventures of a deep space hospital ship and its six-member crew. When their vessel, the Nightingale 229, answers an emergency distress signal from a distant galaxy, the crew soon finds itself in danger from the mysterious young man they rescue, the alien artifact he smuggled aboard and the gravitational pull of a giant star about to go supernova -- the most massive explosion in the universe. Box Office: Budget: $60 million. Opening Weekend: $6.731 million. Gross: $14.218 million. DVD: Widescreen 2.35:1/16x9, standard 1.33:1; audio English DD 5.1; subtitles Spanish, French; closed-captioned; double side - single layer; 24 chapters; rated R; 91 min. ; $26.98; street date 8/22/00. Supplements: 13 Deleted Scenes; Theatrical Trailer; Production Notes Booklet. Supernova took quite a difficult path to the screen. Although I haven't found any really official confirmation of this information, a few sources discuss the troubled nature of the production. In a nutshell, the original director - Romper Stomper's Geoffrey Wright got the boot very shortly prior to production because he and the studio didn't agree on the direction the story should take. In his place came veteran director Walter Hill, who shot all of the principal photography in 1998 and worked extensively on editing the piece. Things still didn't work out, so Hill took a hike and Jack Sholder manned the editing booth. Apparently he came along with the film until MGM board member Francis Ford Coppola got a look at the results and decided he could do better. As such, he tried his hand at editing Supernova, and presumably his final cut is what ended up on the screen, though the film bears the pseudonymous name of "Thomas Lee" as director. Supernova hit screens early in 2000 with little hype and many bad reviews. Predictably, the movie tanked at the box office as it grossed a tremendously weak $14 million, only a fraction of its costs. I skipped the film when it ran theatrically largely because of the negative press. I enjoy science fiction action flicks, but there are too many bad ones for me to ignore the reigning critical sentiment. As such, I didn't mourn the quick box office death of Supernova, since it seemed to be just another piece of galactic junk. To my mild surprise, it actually turns out to be a decent little movie. While I don't think it's a classic by any stretch of the imagination, I honestly don't know why it inspired such vitriolic negativity; even with some flaws, Supernova provides a mildly fun ride. The story very directly steals from Alien. In fact, it's so shameless that it actually uses some nearly-identical dialogue, such as when characters refer to taking their chances in a shuttle. Supernova lifts from other films as well - I got a serious vibe related to the 1986 version of The Fly at times - but Alien remains the dominant source. In no way does Supernova approach the heights of that classic, nor can it compete with any of Alien's sequels. Nonetheless, I thought it provided a fairly brisk and spry little adventure. The plot is basic, the characters are poorly-drawn and stereotypical, but still it kept me interested and got my adrenaline pumping at times. The cast of Supernova reads like a "who's who" of almost-wases. James Spader, Angela Bassett, Robert Forster, Lou Diamond Phillips... that's a serious crew of recognizable names and faces without a single true star in the bunch. Still, it's a solidly competent crew that performs their tasks responsibly. I can't say that any of them provided particularly compelling work, but their acting seemed acceptably strong. Possibly the most interesting participant in the cast was Peter Facinelli. That's not because he provides a particularly compelling performance, for he doesn't; he's not bad but he does nothing especially terrific. No, Facinelli stood out to me because the guy resembles Tom Cruise's stubbly kid brother. I couldn't get over how much his style and delivery resembled that of Cruise. Intentional thievery or coincidental similarity? Dunno, but the resemblance was startling. Considering the lack of originality found in Supernova, I guess it shouldn't come as a surprise that at least one of the actors seems to clone another (more famous) performer; the movie's a blatant knock-off of other superior films. Nonetheless, I enjoyed my brief time with Supernova. It doesn't expand or challenge the action/sci-fi/horror genre, but it provides a fun and intermittently exciting example of the field. Note: the DVD release of Supernova contains the "never before seen" R-rated cut of the film. Since I didn't view the movie theatrically, I can't say how the versions differ, but any additions must have been minor; the R-rated film only runs one minute longer than the PG-13 edition. I'd assume that a little more graphic violence appears in the DVD's version, plus we may get some additional skin. Don't expect anything radical, however. 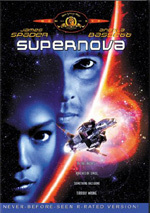 Supernova appears in both its original theatrical aspect ratio of approximately 2.35:1 and in a fullscreen edition on this double-sided, single-layered DVD; the letterboxed image has been enhanced for 16X9 televisions. Only the widescreen side was rated for this review. Overall the movie looks quite terrific, with only a few notable flaws that affected my rating. Sharpness seems extremely crisp and detailed, with virtually no instances of softness or fuzziness during the film. I detected no evidence of jagged edges but saw some mild moir� effects from the usual suspects (lots of metal grates in this movie) and I also witnessed moderate artifacts from the anamorphic downconversion on my 4X3 TV. Colors looked wonderfully accurate and bright. The palette tends toward gun-metal blues and warning-alarm reds - with a little purple tossed into the "alien" mix - and all hues seemed very solid, with rich and lush coloration that lacks any noise or bleeding. Black levels also appeared deep and dark, and shadow detail looked appropriately dense with no signs of excessive opacity. The latter aspect's important since much of the film takes place in low-light situations; they all come through with excellent clarity. Print flaws were the only thing that kept Supernova from reaching "A" level. This movie only hit screens seven months ago, and I expect such a recent film to present virtually no defects. Unfortunately, I witnessed light but consistent black grit throughout the movie, and also saw a little speckling and a couple of nicks. The flaws aren't extreme but simply shouldn't exist in a brand-new movie, so they single-handedly dropped my grade to a still-solid "B+". Even stronger is the Dolby Digital 5.1 soundtrack of Supernova. It's a terrifically active affair, with well-delineated audio that emits from all five channels. As is typical, the front spectrum gets the majority of the action, with most dialogue coming from the center and lots of effects and music from the sides. The rears kick in quite a lot of sound as well. I heard nicely-defined discrete audio from all sides, and we even got a lot of speech isolated to the surrounds from the ship's computer "Sweetie". It's a broad and satisfying mix. Also solid is the audio quality. Although speech occasionally seemed a bit dull and flat - a problem that mainly affected Facinelli's lines, oddly - dialogue usually came across as distinct and natural, with no issues related to intelligibility. Music appears a little subdued in the mix - mainly because of the prevalence of the action elements - but the score sounded clear and smooth, with appropriate dynamic range. Effects worked best of all, as they appeared bold and crisp and also demonstrated some terrific low end. Actually, bass response was excellent throughout the whole film, and it added some nice depth to the mix. Ultimately, Supernova provides a fine audio experience. In regard to supplements, the most significant addition comes from the 13 deleted scenes included on the DVD. These total about 20 minutes, but the running time of each varies radically. The longest clip lasts about five and a half minutes, plus we find one four minute snippet; all of the rest run between 25 and 90 seconds. For the most part, the scenes simply restored fairly unnecessary exposition, but the longer ones added different elements to the story. I won't discuss those, since they relate to parts of the final plot, but I was happy both tangents were omitted; they seemed silly and pointless, and since the movie already has its problems, it was good these weaknesses disappeared. Nonetheless, I was pleased to see the cut scenes on the DVD. Finally, the DVD includes the film's original theatrical trailer plus a booklet with some decent production notes. Although the latter text's emphasis on special effects is logical, I nonetheless was amused to note the lack of mention of a director; I can't recall ever having read production notes of this sort that didn't refer to the film's leader in any manner. Wonder why? Even without a director, Supernova ended up as a mildly entertaining piece of space fluff. It's derivative and flawed, but ultimately I thought it was fairly fun and exciting, and that's the most important part. The DVD provides pretty good picture and terrific sound plus a few decent extras. The movie's not good enough for me to recommend purchase, but I think fans of the genre should at least give it a rental.